October half term fun in Shakespeare's England! Shakespeare's England is offering a host of fun inspired things to see and do during October half term from 22 - 30 October including plenty of spooky family events! Carve pumpkins, hear ghost stories and follow ghost trails, cast spells, make a spooky puppet, create a theatrical mask, have a go at quill writing and enjoy apple tasting and autumnal crafts. Visit the Royal Shakespeare Company for a range of activities inspired by the forthcoming production of The Tempest, walk in the footsteps of the world's most famous playwright as part of Shakespeare Steps and, to celebrate the opening of their brand new visitor attraction, The Play's The Thing, children can create a theatrical mask, have a go at designing a stage set and learn how music and sound are created. Families can enjoy free theatre inspired activities to celebrate Fun Palaces, a campaign which aims to put culture at the heart of every community. On 2 October at The Other Place visitors can see a rehearsal room, learn how fights, bruises, cuts and scars are created and take part in theatre skills workshops. Shakespeare's Schoolroom & Guildhall will mark six months since its opening with a special Parents Go FREE! offer available from 17 - 23 October. Shakespeare's Schoolroom & Guildhall gives visitors the chance to learn about Shakespeare's early life and explore the building where he learnt to read, write and first enjoyed professional theatre. Children can bring their parents along for free and join the 'Schoolmaster' for a Tudor lesson plus have a go at quill and ink writing and dress up in Tudor clothes. Children can enjoy spooky fun at Shakespeare's New Place, vote for their favourite Shakespearian ghost and make their own spooky puppet to take home. Visit Shakespeare's Birthplace to discover spooky secrets in the Halloween Corner. Make your own Halloween puppet and dress-up as a witch from Shakespeare's Macbeth. At Anne Hathaway's Cottage follow the woodland trail and discover the ingredients that were used in Tudor potion brewing. Mix your potion and cast your spell. Free Halloween cupcake for anyone who comes in costume. Celebrate the feast of All Hallows day at Mary Arden's Farm and discover Tudor traditions of the holiday plus try your hand at some pumpkin carving. Prepare to be scared as The Haunted Castle returns to Warwick Castle with six all-new thrills and spine chills to tantalise the senses. By day, there are fun and friendly scares including the new Horrible Histories Maze, and a very different, truly terrifying, experience by night with new actor and special effects led experiences. 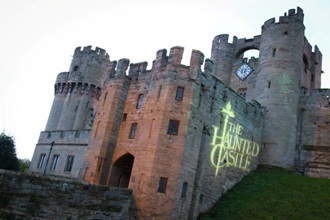 Ultimate thrill seekers can enter Warwick Castle After Dark, open until 9pm, when the ghastly ghouls of the Castle's turbulent 1,100 years of history return to life. Entry costs from just £14. Visit Hill Close Gardens in Warwick for its Apple Day & Country Fair on 16 October and enjoy harvest festival displays, apple tasting, live music, craft stalls, workshops and bees in the gardens plus the chance to buy honey and bee related items. Wood carvers will show visitors how to have a go at this ancient art and spinners will work a traditional weaving wheel. Cost is £4 for adults and £1 for a child (5-17) under 5's free HCGT & RHS members FREE. Children can discover autumn in the gardens with a family workshop on 27 October with autumnal crafts and a garden trail. Cost £4 per child. Use stencils based on nature to create a college in a jar at Compton Verney. The jars will be part of a landscape commission designed by artist group, Creatmosphere in the Park. From 29 October - 19 November, Creatmosphere will create Life in Light, to highlight the 'Capability' Brown landscape using light in a playful way. Architectural features will be lit with lasers; trees will be flooded with light and the lawns will be illuminated by lanterns. New on display in the Minibeast Metropolis at Stratford Butterfly Farm are a number of Giant African Fruit Beetles and Rhinoceros Rat Snakes. The Leafcutter Ant Colony has continually increased in size since its arrival in January and is now one of the largest on display in the UK. In the Discovery Zone see the crops that the ancient Maya farmed in the rainforest and are still farmed today including cacao saplings, the source of chocolate. Visit Kenilworth Castle for a feast of frightening fun and be scared silly with spooky tales plus enjoy getting hands-on with creepy crafts and activities. Stratford Literary Festival invites children to a Mad Hatter's Tea Party on 28 October at Stratford ArtsHouse to mark the anniversary of one of the most loved children's books. Children between 3 and 11 can dress in character and immerse themselves in Alice in Wonderland, joining in drama workshops with Playbox Theatre and creating tea party props with Escape Arts. There will also be face painting and a story from The Caterpillar. Tickets, (include 3 workshops and tea party), are £25 (£10 for adults) and tea party only tickets are £10 (children & adults). Become a reporter at the British Motor Museum with their 'British Motoring Times' family trail, explore the Museum and fill in the missing headlines. Or search for the Museum cats and find the colours of the Cats' Eyes in the 'Black Cat' trail. Drop in to Learning Space 1 between 10am and 4pm to design your trick or treat mode of transport. Alternatively join one of the family tours at 10.45am or 1.30pm with costumed explainers. Leamington Spa Art Gallery & Museum hosts The Big Draw which is all about STEAM - Science, Technology, Engineering, Arts and Maths from 1 - 30 October. Children can draw an invention that brings together art, science and technology to create a new gallery exhibit. On 29 October there will be art and craft sessions using their mobile Art Cart. Explore its drawers and pockets to discover lots of activities inspired by the displays.